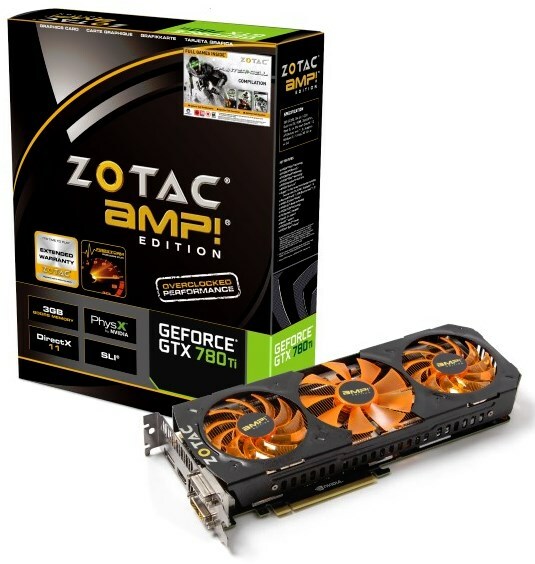 Zotac introduce the GeForce GTX 780 Ti AMP! Edition. This version features a custom, triple-fan cooling solution and features a 1006MHz baseclock, 1072MHz boost and 3GB GDDR5 memory clocked at 7200MHz. ZOTAC International, a global innovator and manufacturer of graphics cards, mainboards and mini-PCs, today reveals the flagship GeForce GTX 780 TI AMP! Edition graphics card. The new addition to the ZOTAC GeForce GTX 780 Ti family takes the world’s most powerful GPU and cranks up the clock speeds for unrivaled smoothness and performance. The ZOTAC GeForce GTX 780 Ti AMP! Edition delivers unrivaled performance and features with a world-class GPU and fine-tuning by ZOTAC. NVIDIA GeForce ShadowPlay technology enables gamers to record and share their favorite gaming moments with the ZOTAC GeForce GTX 780 Ti AMP! Edition to share to social networks for the world to see. Demanding gamers can install up to three ZOTAC GeForce GTX 780 Ti AMP! Editions with NVIDIA SLI technology for an unstopping gaming experience that smoothly renders games at 4K resolutions and ultra-quality details. The ZOTAC GeForce GTX 780 Ti AMP! Edition can drive up to three monitors in gaming mode with NVIDIA Surround technology for outstanding immersion. It’s time to play with the ZOTAC GeForce GTX 780 Ti AMP! Edition.